Let's play some big gbs on pkrstars. If you bring your thrones here, you might get another one. Just a place for all your family and friends! Enjoy! This Badge costs 30 gold bars. This badge costs 20 gbs. WHO DOES 4W9 10W22 30W70??? These people are trusted dealers and have the power to remove dealers who scam. These users can hold bets. The people in this group are Owners and Managers. These people can sell all booths and are 100% trusted to hold bets. You shall not pass. Unless you have this badge, then.... come on in I guess. 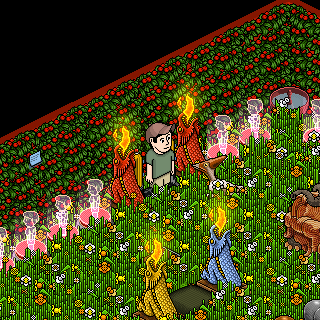 Prepared for the biggest day of a Habbo's LIFE? Marriage!